Hair loss is one of the most common problems faced by the people all over the world. it is normal to lose a few strands of hair when you comb your hair. But when the hair strands falling is large in number, then it is problem that is to be well taken care of. The causes for hair fall may be due to dandruff, unhealthy life style, infection of the scalp, hormonal changes, pollution, dust, and also improper care of the hair. Due to fungal infections hair may fall in such a way that patches are formed on the scalp. In some people the hair may become so thin that the scalp will be exposed. Hair fall may also be genetic. If the father has bald head, the son also usually inherits this trait. Most of the hair problems can be greatly reduced by following a healthy life style and treating your hair with hair care products that suit your hair. Try to use natural hair products instead of those with lots of chemicals in them. People follow various treatment methods to prevent hair loss like using herbal shampoos and oils, natural hair conditioners, ayurvedic treatments, spa etc. Nizoral shampoo is a hair care product that is globally accepted as one of the best for treating dandruff and infections of the scalp. This it is very effective in preventing hair fall also. Nizoral shampoo is manufactured by Janssen Pharmaceuticals and is a synthetic drug that has antidandruff properties. It is also very effective for preventing hair loss. It is red orange in color and consists of active ingredients as well as inactive ingredients like coconut fatty acids, sulfates, laurdimonium hydrolyzed animal collagen, sodium hydroxide and so on. The active ingredient Ketoconazole in it has great antifungal properties and is very effective in treating fungal infections that occur on the scalp. How Good is Nizoral for Hair Loss? As you have read earlier, the antifungal properties of this shampoo prevent the growth of fungi on the scalp. It damages the cell membrane of the fungi and prevents the production of ergosterol, which is an element needed for the production of cell membrane in fungi. As a result the fungus gets killed. 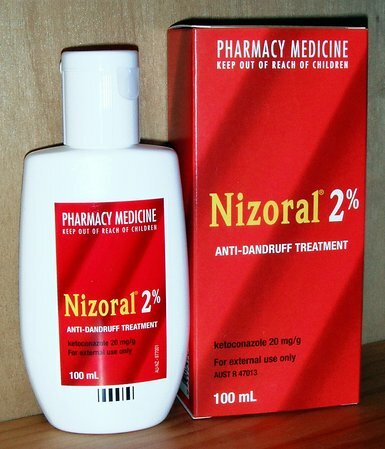 Nizoral shampoo is able to treat seborrhea dermatitis, dandruff and many other fungal infections of the scalp. Dandruff is usually formed when your scalp and hair get dry. Dryness causes sebaceous glands to produce extra sebum, so that the moisture of the scalp is maintained. As a result of excess sebum and dandruff, the hair follicles are blocked and normal growth of the hair is interrupted. It also prevents nourishment of the hair and affects the normal health of the hair. The hair fails to get the nutrients that it needs and remains dry. This leads to falling of the hair. Nizoral shampoo keeps the scalp and the hair hydrated and also treats dandruff, preventing the production of excess sebum and scalp built up. As a result, the hair follicles do not get blocked and they give rise to healthy and strong hair strands that are thick and long. Another advantage of Nizoral is that it has androgen blocking properties. Androgen is a male hormone that is responsible for giving masculine characteristics to men. But this hormone also causes hair loss. As you know, hormone changes are one of the main causes for hair loss in both men and women. The hair gets its essential nutrients through its dermal papilla, which is in direct contact with the blood that circulates in your scalp. The papilla also contains androgen receptors, which combine with androgen and caused hair fall. The androgens thus combining with the androgen receptors interrupts with the absorption of essential nutrients from the blood by dermal papilla. As a result of getting less nutrients, the normal health of the hair is affected and this leads to hair fall and alopecia. So you see that Nizoral helps in protecting the scalp and the hair from all these problems. Due to its anti androgen properties, it prevents the hormonal processes that may take place on the scalp. If this process is left untreated, it may lead to scalp inflammation and hair fall. Nizoral soothes the scalp and cleanse it, relieving inflammations. It also helps in getting rid of dandruff and many other scalp infections. In addition to all these, it also protects the scalp from the damages caused by the male hormone androgen. As a result, your hair will remain healthy and grow thick and strong. This shampoo is only for external use. Wet your hair and scalp and apply the shampoo. Leave for 3 to 5 minutes. Then wash off thoroughly with water. Take care that it does not enter your eyes. If it happens to enter the eyes, wash your eyes thoroughly with water. If you are thinking about how often to use this shampoo for hair loss, Then using the shampoo twice a week and there after continuing it for 2 to four weeks, till the dandruff is fully cured is the best solution. After that you can use it once in every 1 or two weeks, so that the dandruff does not occur again. Do not use it more than that prescribed by the doctor. Once you apply this shampoo on your scalp, very little of it is absorbed by the skin. So usually no toxic elements from the shampoo get in to your blood stream. Moreover, it is also not affected by sunlight nor does it cause any allergic conditions when exposed to sunlight. Anyone can use the shampoo, most preferably after consulting a doctor and according to his prescription. Even if you are pregnant, you may use it without any fear. Breast feeding mothers can also use it. Some people may suffer from a few side effects like itching, small bumps on the scalp and burning sensations after using this shampoo, but it is very rare. If you suffer from any of these symptoms, stop using the shampoo.